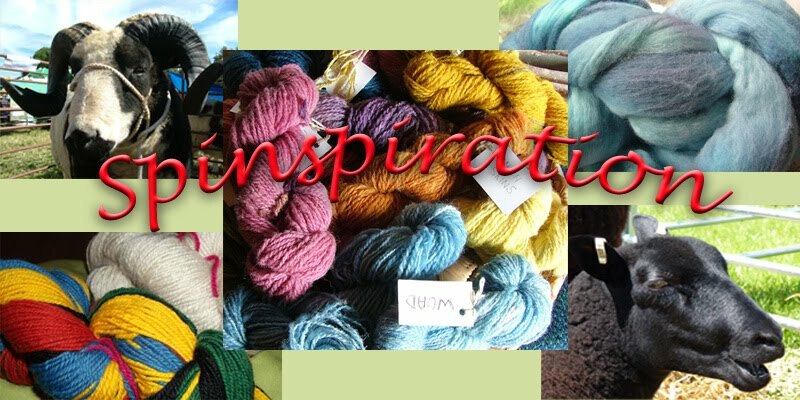 Spinspiration: Planning a woolly Christmas! First of all I ought to say "Hi" and introduce myself. I'm Claire, and have been taking part in Spinspirations monthly get togethers since the offset, but now am helping with Spinspiration in a more formal sense. I blog over at Simply...Life as well as at Aisling Designs. I'm a mother to four children, and have been spinning for what will be two years this coming Christmas. As a crafter, my mind is already turning to Christmas, things to make, mainly for others, and possibly a little for myself. I am currently spinning up more wool (Zwartble/Suffolk cross from Dawn) for a macBook cover commission, based on the iPad cover I made for someone. Earlier this year I was making a couple of rings for the Guild Exhibition that was held in July. The Robin was the one that was eventually sent down there, and it has now made it's way back home, and yesterday I was able to give it to my Mum for her birthday present, as she was rather taken with it as I was making it. I also made a seascape one, which has had lots of interest in it over on Etsy. As ever, with me, so many ideas, so little time. But it is safe to say, I will be spending the next couple of months working with alot of wool! Off to see what everyone else is up to.